At an airshow in San Diego in 1989, famous test pilot Bob Hoover was entertaining the crowd in his small, piston-powered Shrike Commander plane with a couple thrill-seeking passengers in tow. At about 300 feet off the ground during takeoff, the engine lost all power. Though Bob crash landed the plane, his expert flying skills saved his own life and that of his two passengers. Upon examining the plane, Bob realized the cause of the accident – the ground crew filled its tank with the wrong fuel. Instead of aviation fuel, an airport employee had filled the piston driven plane with jet fuel thinking it was a turbo prop. This incident helped develop a system that would prevent similar fueling mistakes in the future. The bell-shaped nozzle on jet fuel pumps, dubbed the Hoover Nozzle, prevents a jet fuel supply from connecting to an aviation fuel tank in airplanes. While most industry accidents are not as dramatic as crashing a plane, the consequences can be equally disastrous. Using the wrong fuel on machinery could cause millions of dollars in damage. Adding in the loss of production due to downtime results in a very costly mistake. Using a more flammable fuel like gasoline in place of diesel also creates major safety risks. The fuel will ignite or explode, leading to severe injuries and even death. Color coding safety fuel cans helps differentiate between types of fuels to avoid these type incidents. RELATED ARTICLE: What Color Should Your Chemical Storage Be? What Are the Standard Colors for Safety Containers? Red safety cans indicate gasoline or flammable liquids. OSHA specifies that flammable liquids with a flash point below 80 F (27 C) must be stored in a red can with a yellow band. Industry standards specify colors for other flammable liquids, similar to the color conventions for flammable safety cabinets. What Other Safety Features Help Differentiate Justrite Safety Cans? 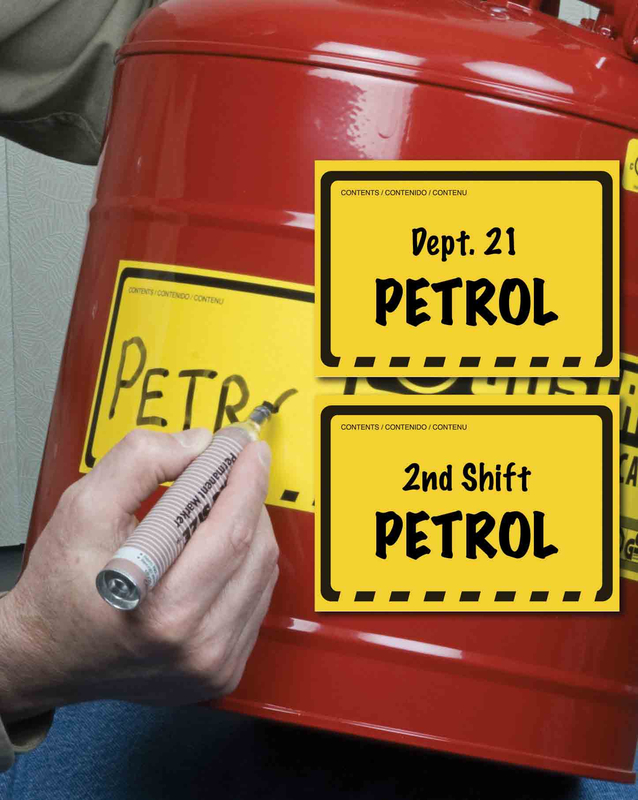 Justrite provides exclusive ID labels to help users identify the contents of a safety can or container. All Justrite safety cans feature a standard band with an ID zone for users to put their own content label in place. Keep this label up to date in case the service of the safety container changes. What Are the Benefits of Polyethylene Safety Containers? Due to its durability and resistance to corrosive chemicals, polyethylene safety cans are often used to store and dispense acids and bases. 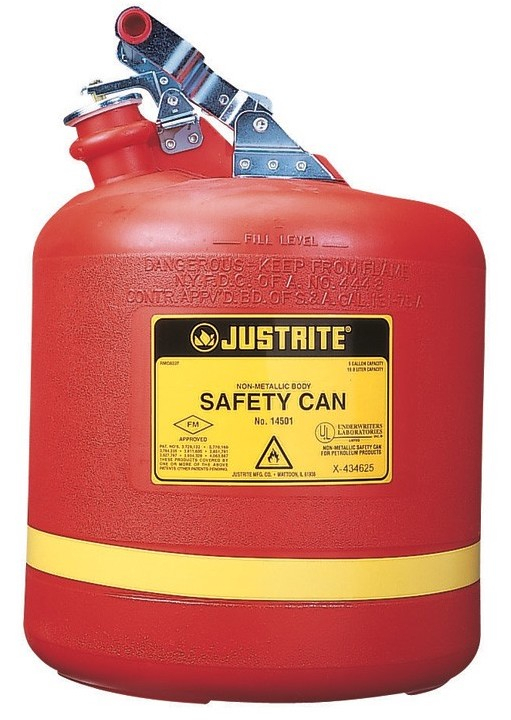 Justrite Polyethylene Safety Cans have a one-piece body construction. They resist dents, punctures and other wear-and-tear associated with abusive environments. RELATED ARTICLE: What Really Makes a "Safety Can" Safe? Color-coded safety cans help differentiate liquids to avoid costly and dangerous mistakes. Prevent equipment damage and severe injuries. Browse through our available options and make your selection here.